Planetary rings are an interesting phenomena. The mere mention of these two words tends to conjure up images of Saturn, with its large and colorful system of rings that form an orbiting disk. But in fact, several other planets in our Solar System have rings. It’s just that, unlike Saturn, their systems are less visible, and perhaps less beautiful to behold. In was not until 1979 that the rings of Jupiter were discovered when the Voyager 1 space probe conducted a flyby of the planet. They were also thoroughly investigated in the 1990s by the Galileo orbiter. Because it is composed mainly of dust, the ring system is faint and can only be observed by the most powerful telescopes, or up-close by orbital spacecraft. However, during the past twenty-three years, it has been observed from Earth numerous times, as well as by the Hubble Space Telescope. 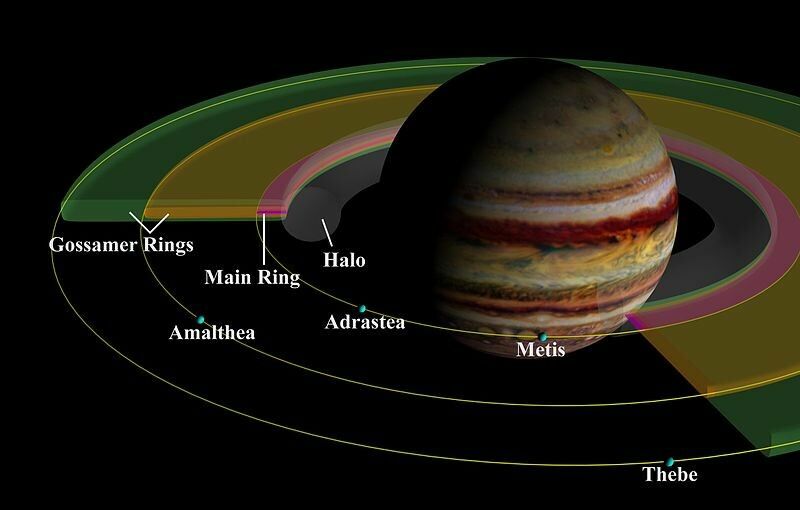 The ring system has four main components: a thick inner torus of particles known as the “halo ring”; a relatively bright, but extremely thin “main ring”; and two wide, thick, and faint outer “gossamer rings”. These outer rings are composed of material from the moons Amalthea and Thebe and are named after these moons (i.e. the “Amalthea Ring” and “Thebe Ring”). The main and halo rings consist of dust ejected from the moons Metis, Adrastea, and other unobserved parent bodies as the result of high-velocity impacts. 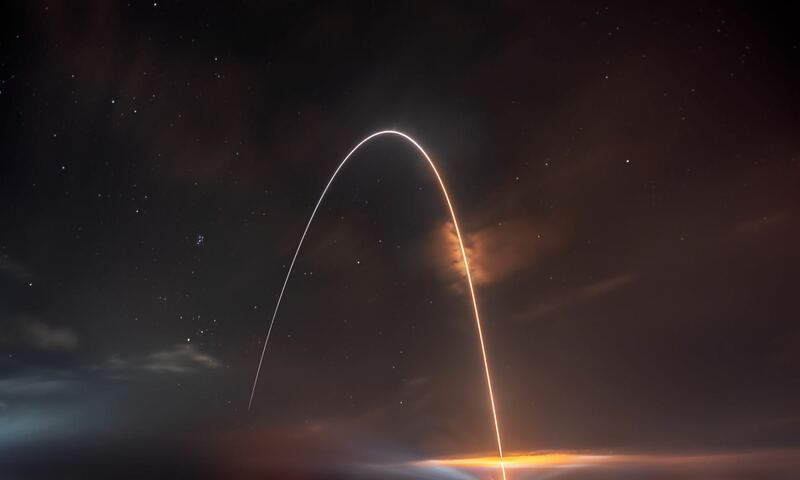 Scientists believe that a ring could even exist around the moon of Himalia’s orbit, which could have been created when another small moon crashed into it and caused material to be ejected from the surface. The rings of Saturn, meanwhile, have been known for centuries. Although Galileo Galilei became the first person to observe the rings of Saturn in 1610, he did not have a powerful enough telescope to discern their true nature. It was not until 1655 that Christiaan Huygens, the Dutch mathematician and scientist, became the first person to describe them as a disk surrounding the planet. 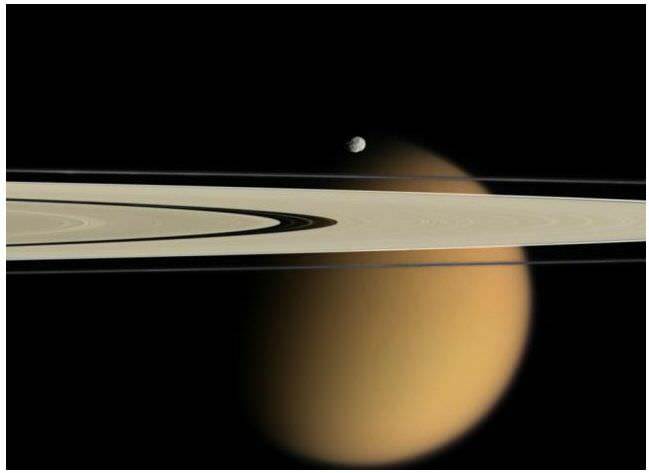 Subsequent observations, which included spectroscopic studies by the late 19th century, confirmed that they are composed of smaller rings, each one made up of tiny particles orbiting Saturn. These particles range in size from micrometers to meters that form clumps orbiting the planet, and which are composed almost entirely of water ice contaminated with dust and chemicals. In total, Saturn has a system of 12 rings with 2 divisions. It has the most extensive ring system of any planet in our solar system. The rings have numerous gaps where particle density drops sharply. In some cases, this due to Saturn’s Moons being embedded within them, which causes destabilizing orbital resonances to occur. However, within the Titan Ringlet and the G Ring, orbital resonance with Saturn’s moons has a stabilizing influence. Well beyond the main rings is the Phoebe ring, which is tilted at an angle of 27 degrees to the other rings and, like Phoebe, orbits in retrograde fashion. The rings of Uranus are thought to be relatively young, at not more than 600 million years old. They are believed to have originated from the collisional fragmentation of a number of moons that once existed around the planet. After colliding, the moons probably broke up into numerous particles, which survived as narrow and optically dense rings only in strictly confined zones of maximum stability. 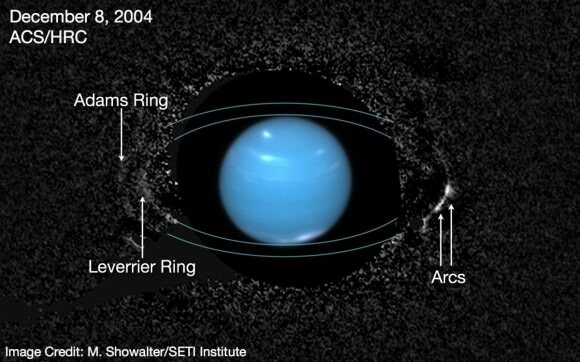 Uranus has 13 rings that have been observed so far. They are all very faint, the majority being opaque and only a few kilometers wide. The ring system consists mostly of large bodies 0.2 to 20 m in diameter. A few rings are optically thin and are made of small dust particles which makes them difficult to observe using Earth-based telescopes. The rings of Neptune were not discovered until 1989 until the Voyager 2 space probe conducted a flyby of the planet. Six rings have been observed in the system, which are best described as faint and tenuous. The rings are very dark, and are likely composed by organic compounds processed by radiation, similar to that found in the rings of Uranus. Much like Uranus, and Saturn, four of Neptune’s moons orbit within the ring system. Back in 2008, it was suggested that the magnetic effects around the Saturnian moon of Rhea may indicate that it has its own ring system. However, a subsequent study indicated that observations obtained the Cassini mission suggested that some other mechanism was responsible for the magnetic effects. Years before the the New Horizons probe visited the system, astronomers speculated that Pluto might also have a ring system. However, after conducting its historic flyby of the system in July of 2015, the New Horizons probe did not find any evidence of a ring system. While the dwarf planet had many satellites aside from its largest (Charon), debris from around the planet has not coalesced into rings, as was theorized. The minor planet of Chariklo – an asteroid that orbits the Sun between Saturn and Uranus – also has two rings that orbit it. These are perhaps due to a collision that caused a chain of debris to form in orbit around it. The announcement of these rings was made on March 26th of 2014, and was based on observations made during a stellar occultation on June 3rd, 2013. This was followed by findings made in 2015 that indicated that 2006 Chiron – another major Centaur – could have a ring of its own. This led to further speculation that there might be many minor planets in our Solar System that have a system of rings. In short, four planets in our Solar System have intricate ring systems, as well as the minor planet Chariklo, and perhaps even many other smaller objects. In this sense, ring systems appear to be a lot more common in our Solar System than previously thought. We have written many articles about planets with rings for Universe Today. Here’s an article about the composition of Saturn’s rings, and here’s an article about the planets with rings. If you’d like more info on the planets, check out NASA’s Solar System exploration page, and here’s a link to NASA’s Solar System Simulator. Saturnalian? I guess you mean Saturnian? I know that I’ve got my pedantic hat on here, but it’s Galileo Galilei NOT Galileo Galilee. One’s a famous astronomer, the other’s a region in the Middle East. Did your spell checker go wild on you ? Next PostNext What is Gravitational Lensing?